Find out how to wear this season's hottest make-up colour. Fashion shows for autumn/winter 15 showed us lots of make-up trends we loved, with one of our favourites being rust and copper coloured eyes. Red-y tones near the eye can be a tricky look to pull off as it highlights any redness in the eyes, but when done right, it incorporates everything we love about autumn in one beautiful look. To get rid of any natural redness in the eyes themselves, try some brightening eye drops. This should help reduce bloodshot eyes, ideal if you’re a bit tired. Our favourite way to wear this colour is above and below the eye, making a ring of colour. Try a shade with a metallic tint for maximum impact. 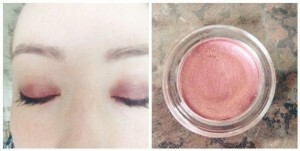 We’re big fans of Maybelline’s EyeStudio Color Tattoo in metallic pomegranate (pictured). Blend out any harsh edges for a diffused colour. Pigmented shadows can look messy or too intense when not blended, so get your fluffy brush out and soften those lines. On the catwalks a lot of models walked with rust coloured eyes and no mascara – while this looks great in a fashion context, we feel the lashes need some definition in real life. Apply a couple coats of mascara and skip the eyeliner. Peachy toned blush and a neutral lip is all that’s needed to finish this look. Let your eyes be the star of the show and don’t forget to groom those brows. Stuck in a make-up rut? Find out how a professional make-up artist could teach you new techniques.